In the absence of a record 15 Scots in the GB team at the Olympics, Capital athletes went on a title spree at the Scottish National Athletics Championships at Grangemouth Stadium. As many as ten gold medals were captured by Edinburgh-based athletes, though not all of them choose to represent Edinburgh AC. Top of the class for commitment must go Avril Jackson (EAC), who took the Scottish Women’s 400 metres hurdles title for the seventh time in the absence of Eilidh Doyle in Rio. Jackson spends two weeks of every month working in Switzerland, but regularly commutes back to Scotland to compete and to see her new coach Francis Smith. The reward was a new personal best of 58.74 seconds, the first time she has broken 59 seconds. distance for nine years (12.09m). Allan Hamilton (EAC) won his first senior men’s long jump title with a leap of 7.52m, while club-mate Chuxx Onyia took the triple jump with a new best of 15.57m. Kirsty Yates (EAC) won the shot putt for the fifth time and another Glasgow 2014 Scottish rep Emily Dudgeon (EAC) moved up to the 1500m to win in 4:25.87. Banchory-based European Youth silver medallist Alisha Rees (EAC) was an impressive winner of the women’s 200m in 23.73 secs, with the following wind of +2.4 mps just over the legal limit. Lon- time Capital resident and Glasgow 2014 veteran Andy Frost won the hammer for the sixth time in the absence of fellow Scots Mark Dry and Chris Bennett in Rio. But in the women’s event former champion Susan McKelvie (EAC) just scraped bronze by one centimetre from fellow 2014 rep Myra Perkins. There was a quality throws double from Nick Percy, who set a Scottish Native record of 59.90m in the discus as well as winning the shot. 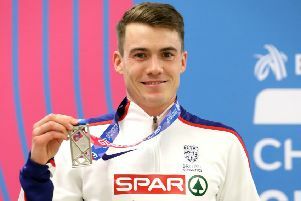 Greg Louden (Lasswade) won his third 400 metres title in 47.89 secs, while in the absence of champion Cameron Tindle (EAC), Louden’s Glasgow 2014 relay mate Grant Plenderleith (Falkirk) stormed to victory in the 200 metres in a new best of 21.11secs. South Queensferry’s Allan Smith, who missed out on the 2014 Games at Hampden, took the high jump with a leap of 2.20m. Though she would much rather have been in the marathon in Rio, GB’s leading finisher in the London 2012 Marathon Freya Ross won the 5000m from EAC teammate Louise Mercer (17:06.63).